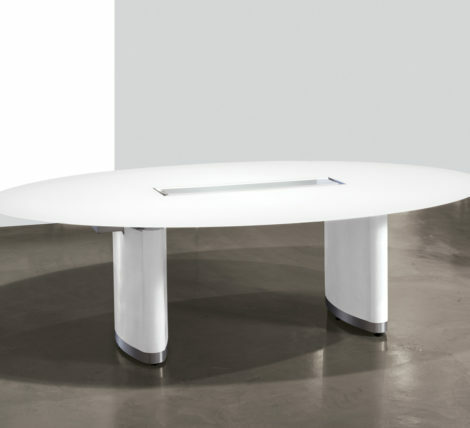 The Custom Flight Table is a top of the line boardroom table built exactly how you want it made. There are no sizes. We work with a team of designers based off your needs. That means tell us the size you want. If you want a different shaped top we can do that! If you want a stone top in a different color. We can do that. You get it. This is a highly specialized product. The Custom Flight Table is unique each time. There are endless options. If you are overwhelmed by choice we’ll help you quickly define your vision and start a quote. Allow time for this special collection. Allow time for the ball park pricing. Allow time for us to show you finish samples. Shop drawings are provided with a purchase order. Lead-time varries but anywhere from 8-11 weeks depending on the design, materials and work load. Delivery and installation to be quoted. If you demand the very best contact Mar direct 310 213-9551 mar@ambiencedore. You’ll need to know the size of table you want. If you need help figuring out the size of table appropriate for your space visit our Conference Room Planning Guide. We work with professional designers, architects and direct with businesses. Call our design team to start your table quote. Let us help you with chairs too!